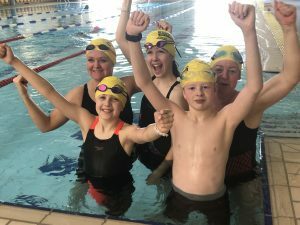 We hosted the Cancer Research Swimathon here at Bridport Leisure Centre on 30th and 31st March. Several individual swimmers and one team took on a mix of 5k, 2.5k and 1.5k swims over the course of two days. They all did brilliantly well and raised a total of £817 for cancer research. Pictured are 5team, with and without their medals, who raised a massive £600 between them. Good work team! We’d like to congratulate everyone involved in making the day a success.